The CI students gave written feedback to competitors in the public speaking and demonstrations categories. 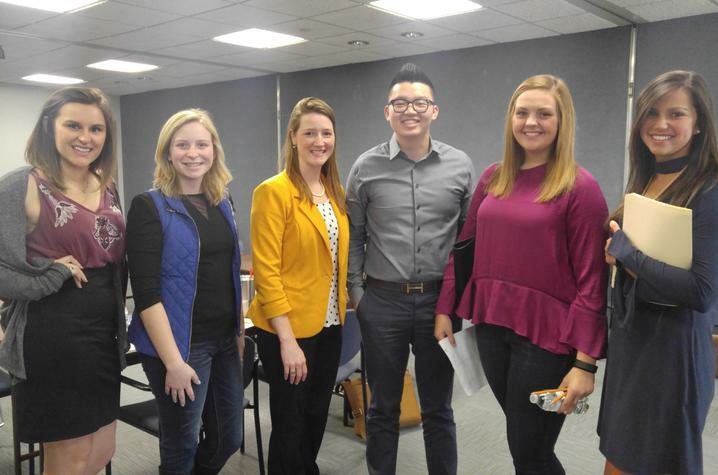 LEXINGTON, Ky. (April 4, 2017) — Six University of Kentucky communication majors from the College of Communication and Information recently volunteered as judges for elementary and middle school speech competitors at the Fayette County Cooperative Extension’s 4-H Communications Event. The CI students gave written feedback to competitors in the public speaking and demonstrations categories, rating them on a scale of 1-5 based on their delivery, presentation, content and overall performance, as well as giving additional comments when necessary. Traci Letcher, a senior lecturer in the college, reached out to her former students to see if they would be interested in judging the young students. “I was thrilled when so many of our students immediately replied and wanted to be a part of this event,” Letcher said. Senior organizational communication major Madalyn Klika was among the UK students that volunteered and noted that it was a really neat experience to be able to help the younger students. “I did not think I was qualified to judge a speech competition, but when it came to it I found I actually did have a lot of valuable advice to give them,” Klika said. The UK College of Agriculture, Food and Environment Fayette County Extension Office was so pleased with the UK students help that they asked the students to return in April to judge the state competition. The Fayette County Cooperative Extension’s 4-H Youth Development Program hosted the event Thursday, March 23. The program strives to create opportunities and supportive environments for youth and adults to become capable, competent and caring citizens. They focus on hands-on learning in the youth’s areas of interest with the help of parents, adult volunteer leaders and professional staff.